The massive, slow-moving lava flow from Hawaii’s Kilauea volcano claimed its first major “victim” on Monday, when it consumed a house on Big Island and completely burned it to the ground. 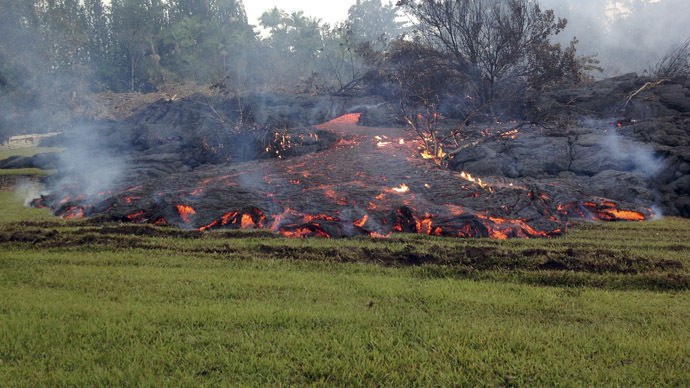 Molten lava from Kilauea has been sluggishly inching its way towards Pahoa since June, though this is the first time it has come encountered a home. The bulbous, black-colored lava started igniting the house as soon as it made contact with the residence, eventually setting the entire building ablaze, forcing its roof to collapse, and absorbing its remains into the flow itself. All told, it took about 45 minutes for the 1,100-square-foot house to come down, the Associated Press reported. 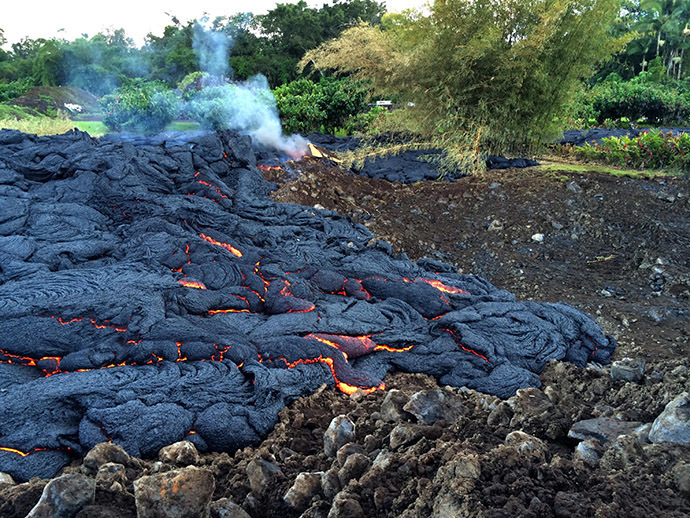 The temperature of the lava has been recorded at some 2,000 degrees Fahrenheit (1,100 degrees Celsius). The house itself belonged to Margaret and John Byrd, who lived there for eight years along with their family and numerous pets. Although the Byrds had evacuated the home in September, some family members showed up on Monday to watch their home burn away. Notably, the Byrds’ daughter, Dianna Wilcox, offered a surprisingly unflappable observation regarding the event. 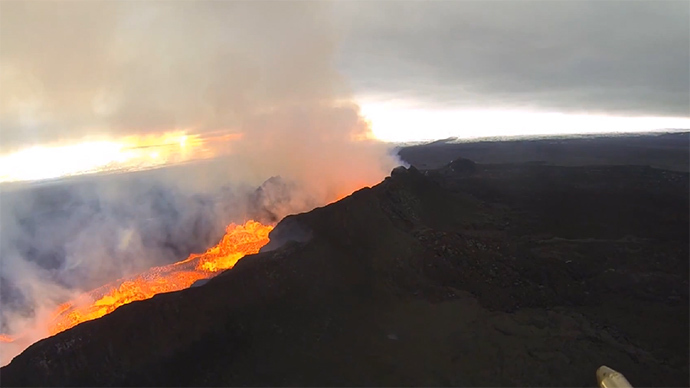 "If you're going to live on a volcano, it's about her, not us," she told AP, referring to the Hawaiian volcano goddess, known as Pele. "If she wants her land back, then get out of the way. I like to call it `paradise tax.'" The family is currently in the midst of constructing another house, this time on a part of the volcano that was previously covered by lava. 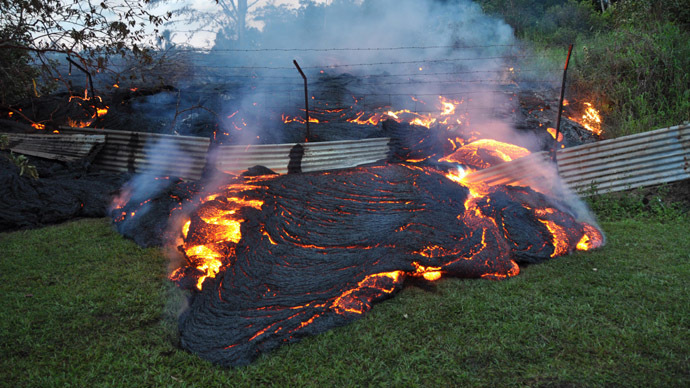 Other residents, however, were not so relaxed about the continued advancement of Kilauea’s lava flow. "I'm scared right now," Imelda Raras, who lives on the same street as the now non-existent Byrd house, said to USA Today. "What will happen next? We will be waiting." 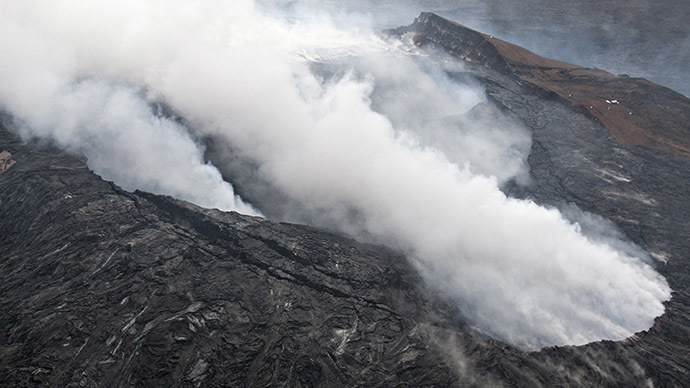 Although Kilauea has been erupting since 1983 – making it one of the world’s most active volcanoes – the vast majority of its lava has flowed right into the ocean. 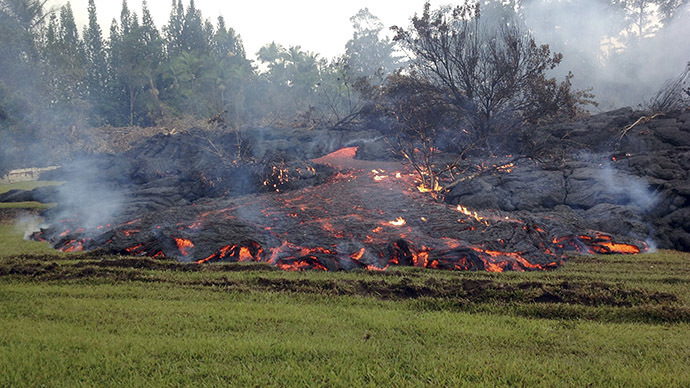 This past June, however, a new vent opened up, placing the molten rock on a collision course with Pahoa. The flow’s leading edge is just under 500 feet away from a road that leads into downtown. Last week, President Barack Obama declared the situation on Big Island a major disaster, freeing up federal aid for the stricken area. 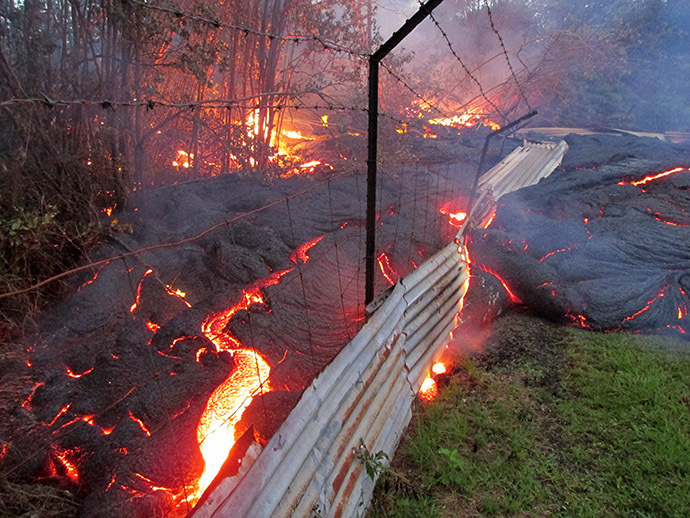 Repairs, protective measures, and aid for those displaced by the lava are now much easier to come by.